Feverish world, or ecotopia now? Feverish World (2016-2068): Arts and Sciences of Collective Survival was premised on the acknowledgment that the coming decades will be feverish in more ways than one — climatologically, politically, economically, militarily — and that the arts will be essential in helping us come to terms with that feverishness. In my comments opening the symposium, I laid out the organizing committee’s thinking about this “feverishness.” In a follow-up event on November 30, EcoCultureLab will explore ways to move forward locally so as to be better able to “meet” that feverishness. My hunch is that the only emotionally productive and sustainable ways forward will be to focus on transforming today’s (and tomorrow’s) challenges into ecotopian capacities: How do we remake society into one that can sustain itself ecoculturally (without fossil fuels and grotesque inequalities) into the longer-range future? What are the visions that can guide this process forward? The following were my opening comments at the Feverish World Symposium. The ecotopic visioning remains ahead of us. Welcome to Feverish World. Welcome to the Feverish World. Welcome to this Feverish World. A fever is felt in the bones, the skin, the viscera; it is experienced bodily, sometimes accompanied (ironically) by chills. But we’ve come to rely on an expert — called a thermometer — to tell us if what we have is a “real” fever or not. Is it over 100 Fahrenheit, 38 Celsius, or not quite? Note that 38 is one Celsius degree higher than the baseline norm of 37. A planet’s temperature — this one’s at any rate — is also measured in degrees Celsius (though it’s averaged out over the entire surface). And a one degree rise? According to IPCC reports: that’s not much at all, and we are practically there. And at the same time it is everything that a planet might want to tolerate without its getting us into a very risky zone. A 2-degree rise is the considered almost guaranteed. And anything above that is considered something like fatal — to the climate regime we’ve grown used to, called the Holocene. A planet can also come to rely on an expert — called science. But our planet is having some difficulty determining how much we should trust that expertise of science. Feverish World — this symposium, which has grown into also being something of a festival as well, and certainly a convergence — is premised on the understanding that fever is still primarily experienced bodily, and not just as a reading on a thermometer. It is a felt form that becomes us: we become feverish, fever takes us over. And perhaps more importantly, fever is a good thing. It’s an immune response that helps a body fight off an infection. Treating a fever is intended not so much to eliminate the infection as it is to make one more comfortable while one’s body deals with the infection. Fever itself is uncomfortable, but it is useful. It’s a good sign to pay attention to. What kind of a sign is fever? Calling our world “feverish” takes us into the realm of metaphor. To avoid metaphor would be to speak in literalisms, which means to speak with a language that has become so settled, predefined, and predigested, that the words we use and the objects they refer to cannot be easily delinked. Their meanings are taken for granted, and with issues that have become, as we say, “politicized” (that is, polarized), we can simply line up on one or the other side of the polarity, like at a football or soccer match, and let the scoring begin. With metaphor, language becomes alive again. This symposium, Feverish World, is premised on the search for a language — a language of images, narratives, and performative actions — that can bring this terrain alive, a language that doesn’t follow preordained destinies but that can experiment with new meanings, new ways of making connection, novel alliances. A language that can reach back to that level of the body’s felt reality — the fever that is felt in the bones and the viscera. History doesn’t occur in 50-year chunks. But let’s imagine that it might. Two such chunks ago, in 1918, almost to this day (give or take a few weeks), World War One formally ended. Soviet revolutionaries formally declared the first nominally socialist constitution, and executed the Romanovs, their aristocratic predecessors. 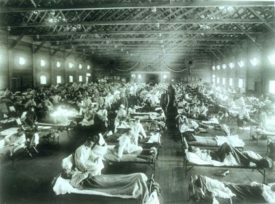 And the Spanish flu engulfed the world, ultimately taking the lives of 50 to 100 million people — the second largest toll of any such disease in history, and far faster spreading than the first (the Black Death). Fifty years ago, in 1968, the world was again awash in revolutions, riots, and protests — protests on campuses and against an unpopular war, and the assassinations of leaders, but this time of leaders who represented the new, not the old (MLK and Robert Kennedy rather than the Romanovs). Much has changed since 1968: television has been replaced by the internet and the smart phone, and the seeming “nuclear stability” of the Cold War has been replaced by today’s poly-unstable, multipolar and multinuclear order. We chose this 50 year window because today’s tensions, challenges, and struggles seem so urgent, so of the moment, and the big challenges — like climate change and ecological disruption (mass extinction and all the rest) seem so ill suited to the 24 hour news cycle, or the annual report, or even the 4 year electoral cycle. 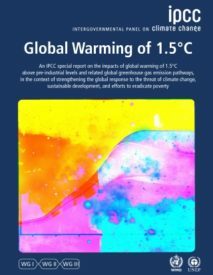 Even the 12-year turnaround period being offered us by the latest IPCC report seems far too little, far too late. We thought that by giving ourselves fifty years we might regain a bit of that sense of agency that we need in order to turn around the present crisis (the eco-crisis being, as Natalie Jeremijenko has argued, at heart a crisis of agency). There’s much more to life, of course, than mere survival. Beyond survival there is thriving. There is flourishing. Those are the ultimate goals. Collective survival, however, implies that there is a collectivity that counts for something, and which our world doesn’t yet seem to have achieved. Torn and riven by inequalities — systemic, structural, institutionalized inequalities that keep us from being anything like a singular humanity — the forging together of a collective agent is still very embryonic. We invite you to join us in envisioning how this embryonic task might proceed, here in the Burlington area and in all the other locales where it might be taken up. 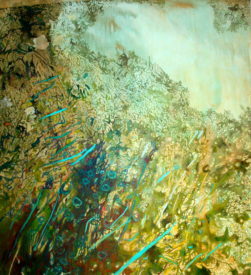 How do we re-envision the possibility of flourishing, with and for others, in this place, this land, this Winosik corner of Ndakinna (as Fred Wiseman will relate to us shortly), a land between two mountain ranges and facing a lake that was once a sea and that still flows out to a sea through a circuitry of waterways and land-water interfaces? How do we draw on our collective capacities to tell new (and old) stories, envision new (and old) ways of relating, and move and act with them into a new (and old) future aligned with the others on whom we depend? How do we transfigure the top-heavy, carbon-choked machinery of colonial-capitalist governance into a network that’s nimble, agile, flexible, and open to the needs of all its constituents? Let’s explore these questions together. Upcoming: ecomusics, climate change culture, etc. i think so, we must explore the colonial-capitalist . can you explain me about carbon-choked machinery? it’s very brutal, god bless them..